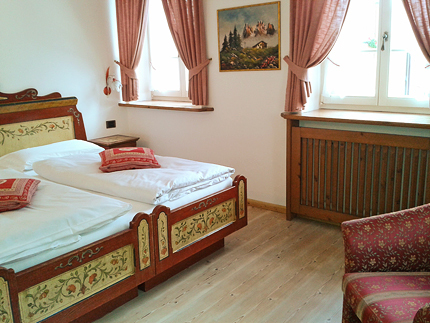 The Garnì (B&B) Stella Alpina is situated at the end of the ski slope at Canazei, in the historical centre of the village, just a five minutes from the spectacular scenery cablecar Belvedere Canazei who is in connection with the famous "Sellaronda". Free public parking is possible at a location nearby (reservation is not needed). 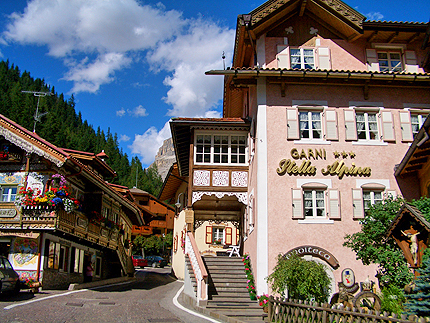 In our near are different boutiques for shopping and restaurants/pizzerias for lunch and dinner. 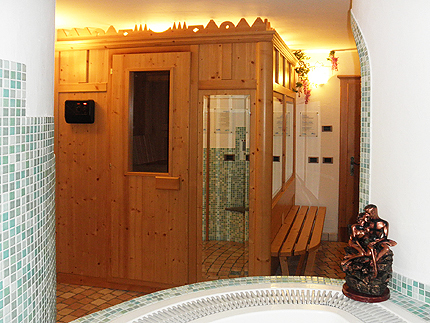 The rooms are comfortable in traditional Ladin mountain atmosphere, they are complete with private bathroom (WC,shower,bide), shampoo and soap, hairdryer, Sat -TV, telephone, fridge, room safe, tea and coffee making facilities, heating, no smoking rooms. Free Wi-Fi connection. Breakfast (continental) is organized in the form of a large buffet. White bread, whole wheat bread, croissant, butter, jam, honey, boiled eggs, local ham and cheese, vegetables, fruit, yogurt, muesli, cornflakes, orange juice, tee, coffee, milk. (except for children under age of 14 years). 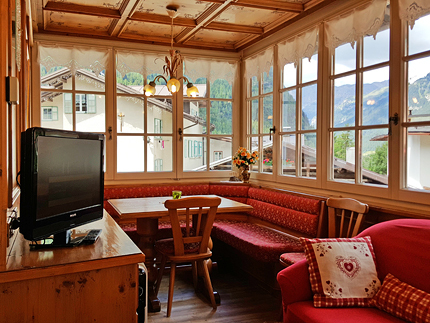 Sometimes we make some limited-time offers for ‘room only’, so the room rate does not include breakfast (and no other food) and it will be possible to book it with Booking.com or directly with us (info@stella-alpina.net). 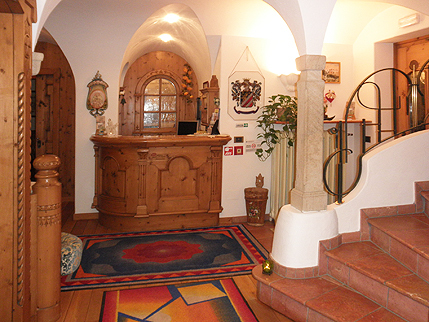 The city tax is to pay extra Euro 1,00 per person (+14years) per night.